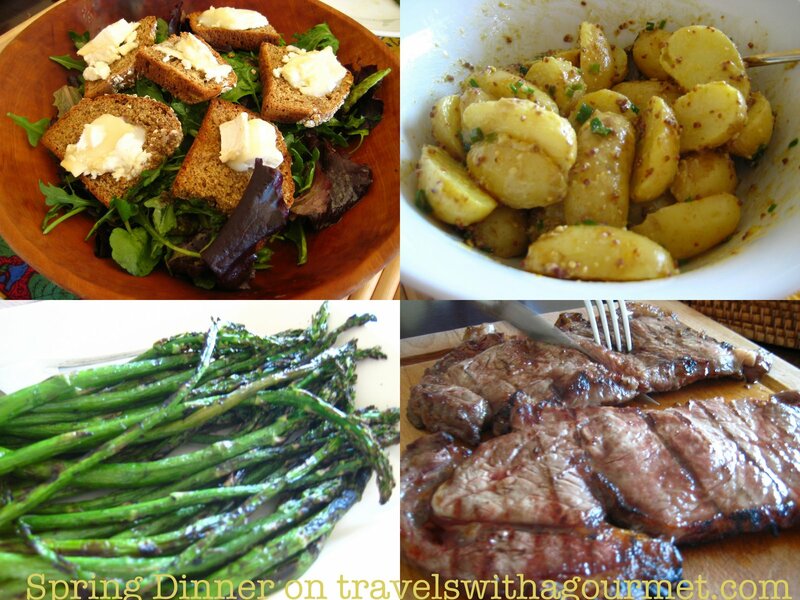 It was another beautiful spring day yesterday – blue skies, warm sun and a slight breeze from the Mediterranean – perfect for a simple dinner of sirloin and young asparagus on the grill accompanied by new potatoes and a salad of goat’s cheese with red onion marmalade. Often the most simple things make the best meal – not much thinking involved, not much time spent – just a quick peek in the fridge to make something with what you have. Luckily, the fridge was still quite full from our weekly shop so we had a delicious impromptu dinner. Boil the new potatoes until cooked through but firm. Drain and set aside. While the potatoes are still warm, make the dressing. Place the 2 mustards in a bowl, add the vinegar and whisk well to emulsify. Slowly whisk in the olive oil and keep whisking until the dressing thickens. While the potatoes are still warm, split the new potatoes lengthwise then add the dressing and toss well. Sprinkle with chopped chives or sliced spring onions. Toast some sliced bread in the oven. When the bread is crisp, spread the goat’s cheese and drizzle some honey on top. Put back in the oven to melt the cheese. Make the dressing then toss the greens in the dressing. Top with the goat cheese toasts and serve with red onion marmalade on the side. I know. Can’t wait for the peaches! I love it that asparagus is in season! So so delicious!